A George Mason University police officer shot at two people Friday morning after they struck another officer on campus. 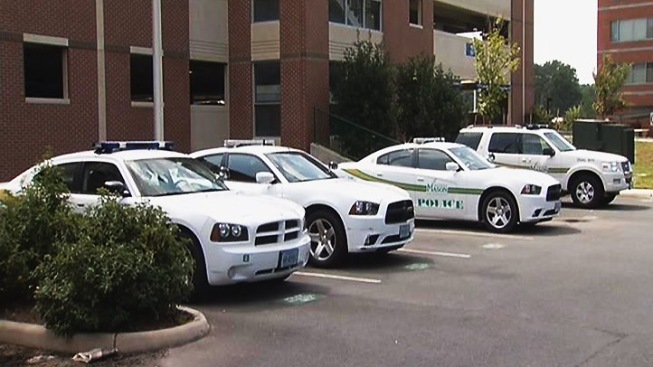 In a garage off Patriot Circle about 1 a.m., officers responded to a call about two people allegedly intoxicated, according to the GMUPD Chief Eric Heath. As officers questioned 19-year-old Rodan Ayala Velazquez and 20-year-old Gian-Carlo Reyes, they jumped into a car and drove away, striking one officer, according to the chief. Her partner fired a shot, hitting the car but neither of the occupants. City of Fairfax police stopped the car a couple of miles away from campus. The men are being held in the Fairfax County Jail. The officer who was struck is OK.
“She's doing well,” Chief Heath said. “I can't comment on her specific medical issues, but they are considered minor injuries." Some students told News4 they were upset they didn’t receive alerts about the incident. “No, I have not received any emails, and my parents haven't either and they're also signed up on the system," Nicole Giordano said. "I didn't get anything,” Hala Nicolas said. “So I never heard about it. That's why my friends told me last night. I mean I wish the university did something better about it or they took better precaution with it." The chief explained why no immediate alert was sent. "Because the situation was immediately contained, there was no ongoing threat or continued threat to the university communities," Heath said. Other students agreed and said they felt and continue to feel perfectly safe on campus. "That's why they put cops here, so stuff doesn't happen, but you know every once in a while it does, so you just got to live day by day,” Kyle Itkin said. “I'm just glad I wasn't here." The suspects are not students at George Mason.